George Graham Reviews Stuart Robertson's "Years Between Us"
Though he was little known outside a small circle of fans and other artists during his lifetime, the late British singer-songwriter Nick Drake continues to have a lasting influence. He died at age 26 in 1974, and while he was alive, none of his albums sold more than 5000 copies each. But his literate, introspective, sometimes jazzy songs with distinctive lyrics, and his quiet, memorable vocals continue to find new audiences among successive generations. Drake's influence has been especially felt among other artists. For example the Dream Academy's 1985 hit Life in a Northern Town was about Drake. In recent years, Drake's music has turned up in television commercials, which gave him a whole new audience. On this album review series, we noted Drake's influence on Duncan Sheik, whose album Phantom Moon was unabashedly inspired by Drake, using the influence in a very creative way. This week, we have a new recording by performer who also takes some inspiration from the sound and style of Nick Drake. It's Stuart Robertson, whose new third studio album is called Year Between Us. Stuart Robertson is 36 years old and from Scotland, born in Edinburgh, and not much else about him has been published. He released his debut album, The Furthest Shelter in 2005, involving musicians from both sides of the Atlantic. His previous recording was a limited edition live CD and download album in 2008 called This Cold Inside. He has apparently developed a following in Portugal, where he has performed a number of times. Unlike Nick Drake, Robertson is a pianist, and most of his songs are piano-based. The new CD is perhaps a bit more laid-back in sound than his previous recordings. The instrumentation is somewhat sparser. In keeping with Robertson's reticence, the new CD lacks any musicians' credits, leaving one guessing whether this was a one-man effort. Robertson lists himself as producer. His songs tend to be lyrically vague, allowing the listener to infer what they will from them, though there are also some more straight-ahead love lyrics, and despite the small backing group, some of the tracks feature extended instrumental interludes. There is what is called the "piano version" of Slipping which is added as a kind of bonus track at the end. But the treatment of the song is rather different in mood as well as instrumentation and running time. 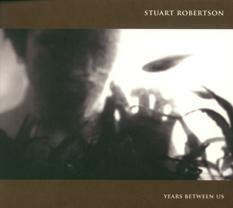 Scottish singer-songwriter pianist Stuart Robertson's new CD Years Between Us is an intelligent and enjoyable recording by an artists who shows the Nick Drake imprint, not that that's anything to complain about. As a pianist, Robertson is obviously going to have a different sound than Drake who played a classical-style guitar. But the laid-back, largely acoustic sound, the interesting compositional touches and the intriguingly ambiguous lyrics come together well to make one of those albums that is both enjoyable and that holds one's attention. Our grade for sound quality is about a B-plus. It sounds as if it was recorded in a modestly-equipped studio, but the mix is well-done. Like most CDs these days, the sound was needlessly compressed, killing the dynamic range of this often-sensitive music. In his day, Nick Drake sold few records. He was never a "pop" artist. But his influence lives on though his durable music that crosses generations. Likewise, Stuart Robertson's Years Between Us is unlikely to get anywhere near the top of the commercial pop charts. But it's also music that in its own quiet way, has a lot of appeal and staying power.